Sequim waterfront property is hot. It always has been. After all, we are on the Olympic Peninsula in an extraordinary location–between the gorgeous Olympic Mountains and the beautiful Strait of Juan de Fuca with the San Juan Islands and British Columbia framed in the living room window. But are there some unique issues with Sequim waterfront property? Yes, and that’s what I want to share today. I took this photo between Sequim and Port Angeles looking to the west, and as you can see the bluff in this area is a little scary looking. This is the most unstable bluff area along the entire coastline here, and major sections of the bluff have been falling off and threatening homes. So the first concern or “downside” of Sequim waterfront property is the stability of the bluff. Further to the east of the lighthouse spit, the bluff is quite stable and well protected from tidal action, storms and bluff baseline erosion. Read more about Sequim Bluff Stability. Assuming you are going to select a Sequim waterfront that is stable, the setback is the next issue. There is a 100 foot setback from the bluff, and they are talking about increasing that to 150 feet. Depending on the configuration of the lot, the topography, and the bluff vegetation, your view can all but disappear on the wrong lot. 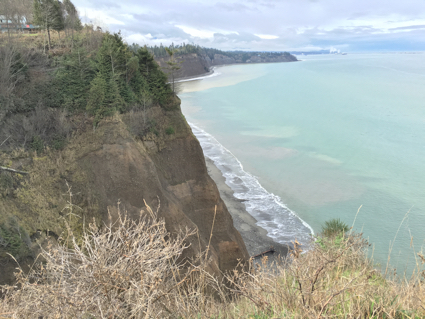 The whole idea of a waterfront lot is to have a view from the windows of your house, but if you have to walk to the edge of the bluff to see the gorgeous view, the lot loses a lot of its appeal. The next due diligence issue if you are considering making an offer on a Sequim waterfront lot would be the height restriction in the covenants (CC&Rs). If the water view for a neighborhood is being protected by a height restriction in the covenants, then you may only be able to build a single level home, and some CC&Rs have low height restrictions, like 16 feet to the peak of the roof. Pay attention also to homeowner association dues and road maintenance fees for private roads or driveways, because there are many private shared driveways when it comes to Sequim waterfront properties. And it goes without saying that a Sequim waterfront property with a clear and panoramic water view will be expensive. Expect to pay $300,000, plus or minus for a nice Sequim waterfront. View Sequim Waterfront and Sequim Beachfront properties here.